A great variety for gardeners who want to enjoy the bold, spicy flavor of arugula a little longer. 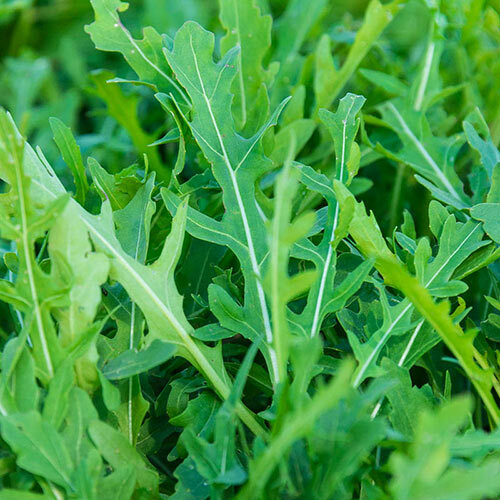 Grazia Arugula has uniform plants with deeply serrated, dark green leaves—and it's slow to bolt. This improved wild variety can be harvested at the baby leaf or mature stage. If harvested frequently, it produces several fresh cuttings per season. Once harvested, Grazia has an extremely long shelf life. When left to flower, it attracts beneficial bees and pollinators to the garden. Can be grown in a container. Grows best when planted in well-drained soil in full sun. 50 DAYS. Spacing1 inch apart, rows 12-18 inches apart. Zones3 - 9 (Annual ). FoliageDeeply serrated, dark green leaves. Growth RateModerate to fast growth rate. Seed CountApproximately 1,000 seeds per packet. CommentsBolt resistant. Improved wild variety. Extremely long shelf life - longest shelf life of any arugala. Spicy, bold flavor. Long harvest period. Attracts pollinators when it flowers (toward end of growth).